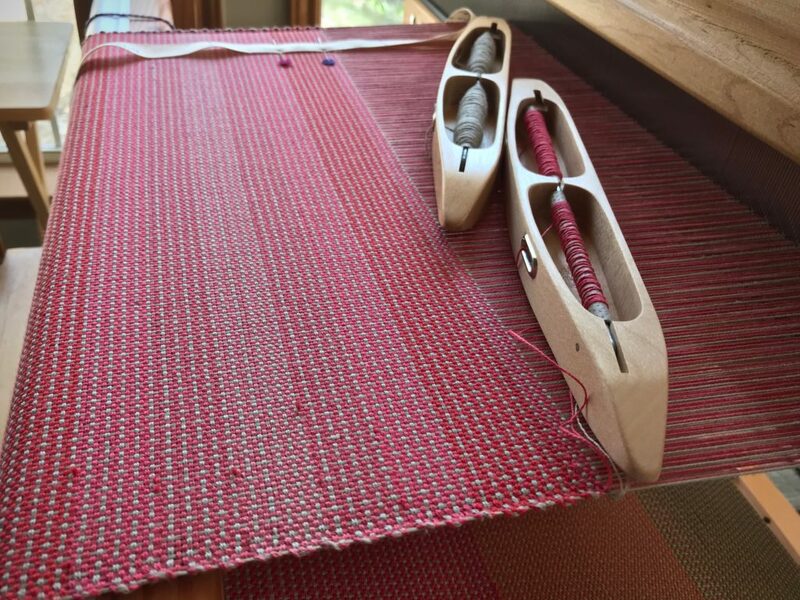 Twelve placemats just came off the loom! Now, for the finishing work. 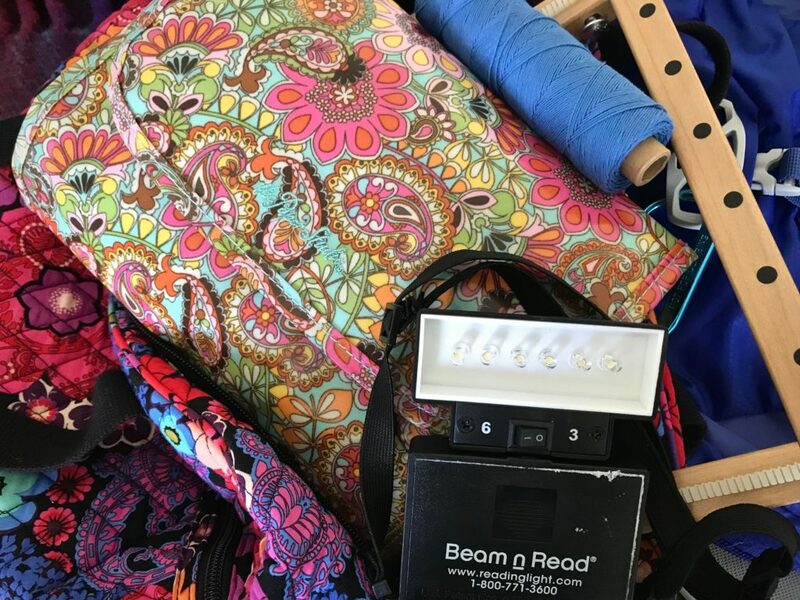 Measuring, examining, repairing, washing and drying, and hemming. Soon they will be ready to dress the table for a home-cooked meal. Mmmm… The focus is on food and fellowship. The placemats are there to catch the drips and crumbs. And then, washed and made ready for the next meal. Christmas. While our focus is on food and fellowship, a beautiful mystery plays out right in front of us. A baby named Jesus entered the world. Christmas celebrates this. Jesus came to take away our offenses, catching our drips and crumbs. The mystery of God is glorious. This is the mystery: Jesus takes our stains, and we who trust in him come out washed and made ready for glory. This is good news, for which a weary world rejoices! May your table be dressed for good times. How appropriate. The number twelve on Christmas morning. It is the quiet of the predawn with the just past full moon reflecting off the snow. Before all the excitement of the day’s celebration. I love God’s color pallet. Hi Nannette, Your scene is lovely. Here, there is no snow, and it’s dark out as I watch for the first glint of light. The bright moon must be behind cloud cover. Peaceful and serene, with apple cinnamon steel cut oats in the crockpot just about ready to feed our celebrants. Good morning, Joyce! This celebration doesn’t end when the wrapping paper is gone. It quietly keeps going all year – in our hearts. 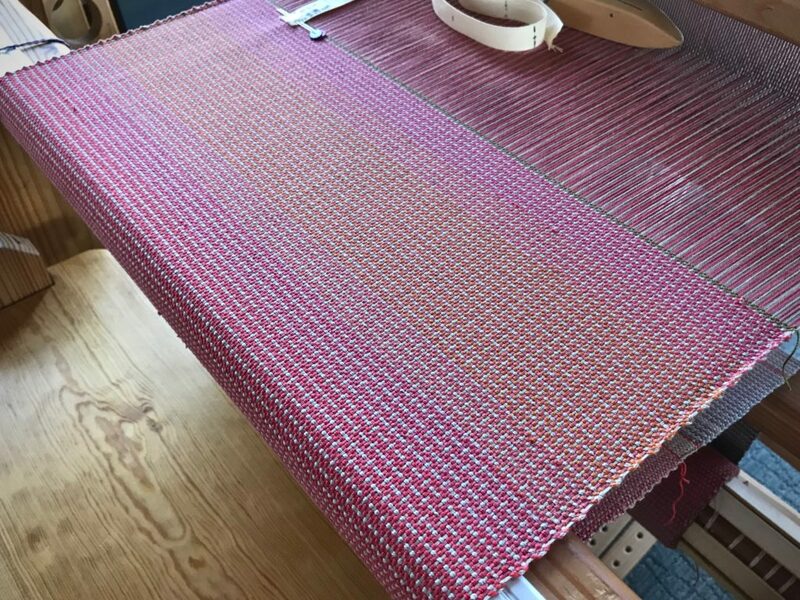 What is the name of that pattern? 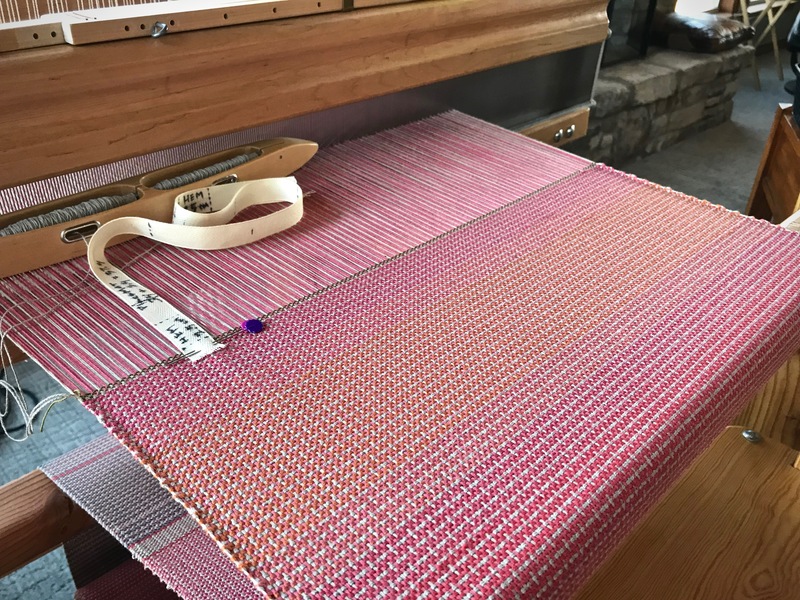 It is perfect for placemats! Love your colors, too! 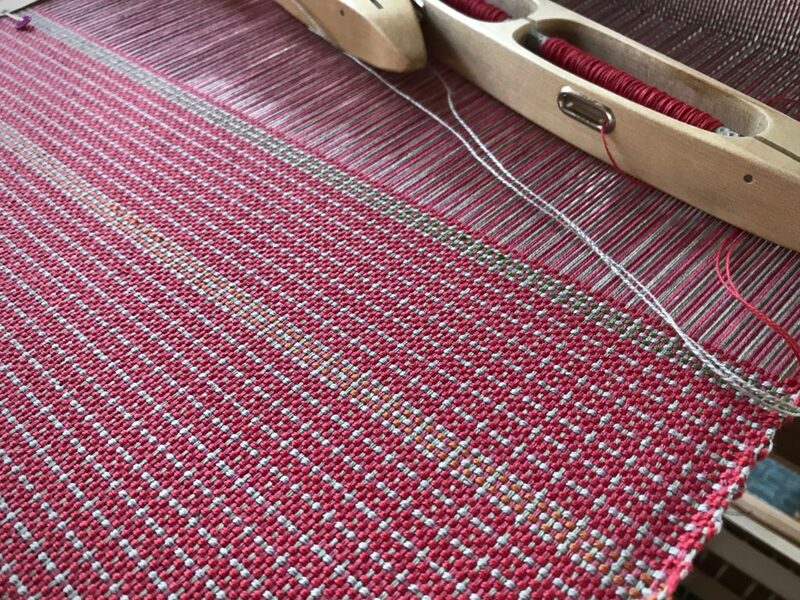 Hi Marjorie, This is simple plain weave, with color and weave effects. I chose the colors from a select palette of colors I am using for this house. 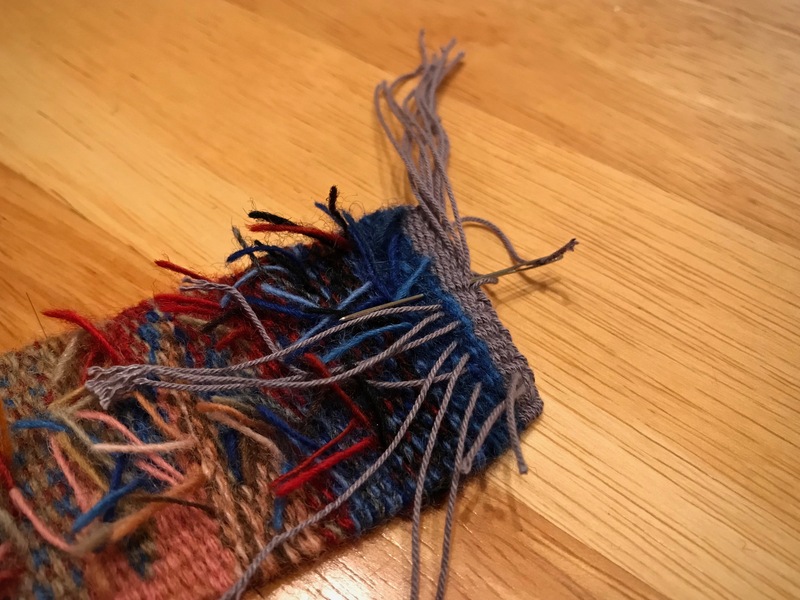 I see you doubled the weft. Was that true of the warp as well? And is this linen? Cottolin? 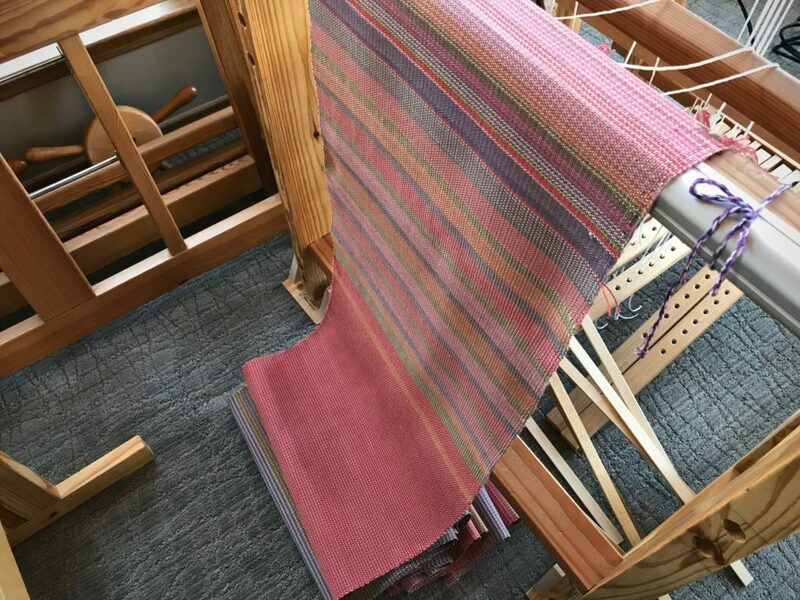 Marjorie, Yes the warp is doubled, too. 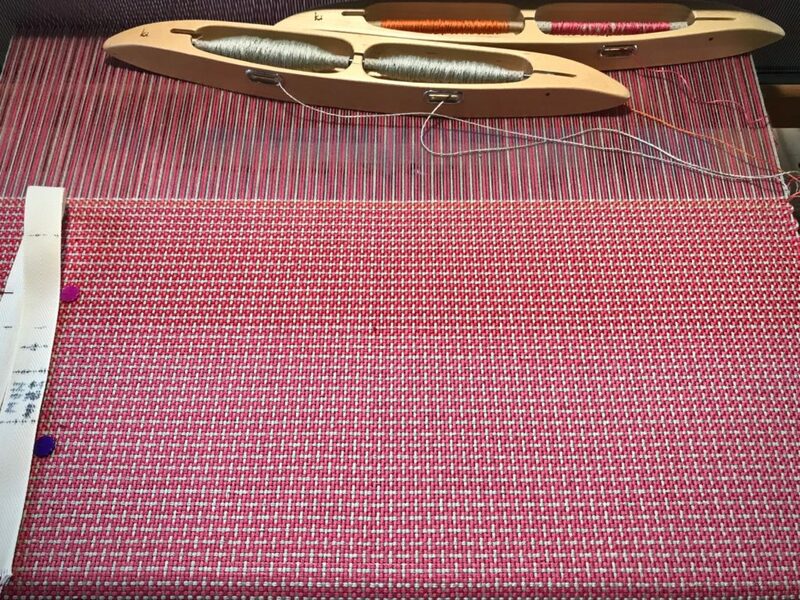 So this plain weave is actually a basket weave, which makes the color and weave possibilities that much more interesting. 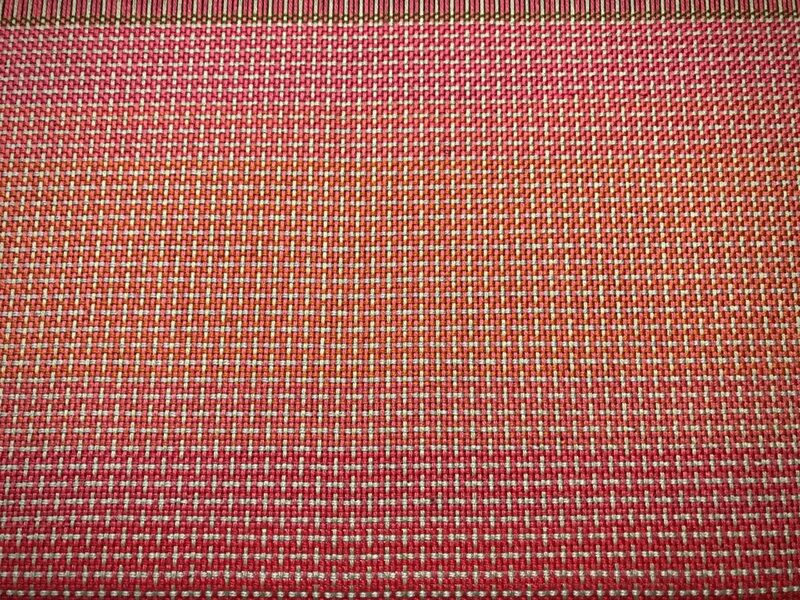 This is 8/2 cotton in warp and weft. Thanks for answering. 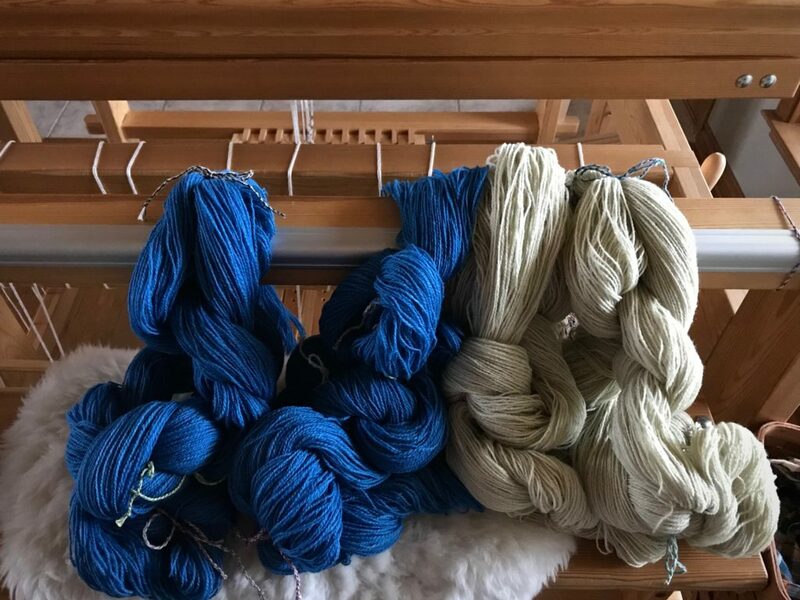 I aspire to become a weaver, and I’m at that stage where I’m trying to figure things out. 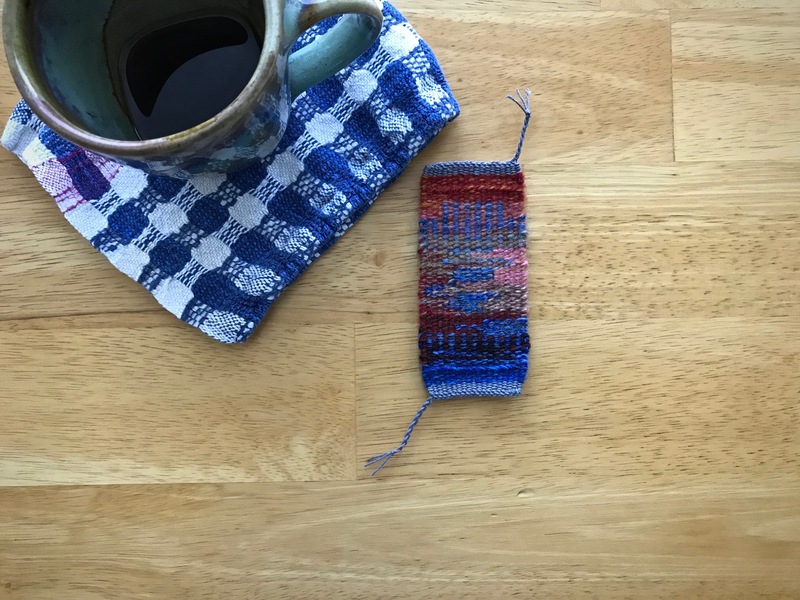 Your placemats are gorgeous, and I love the texture the basketweave gives them. 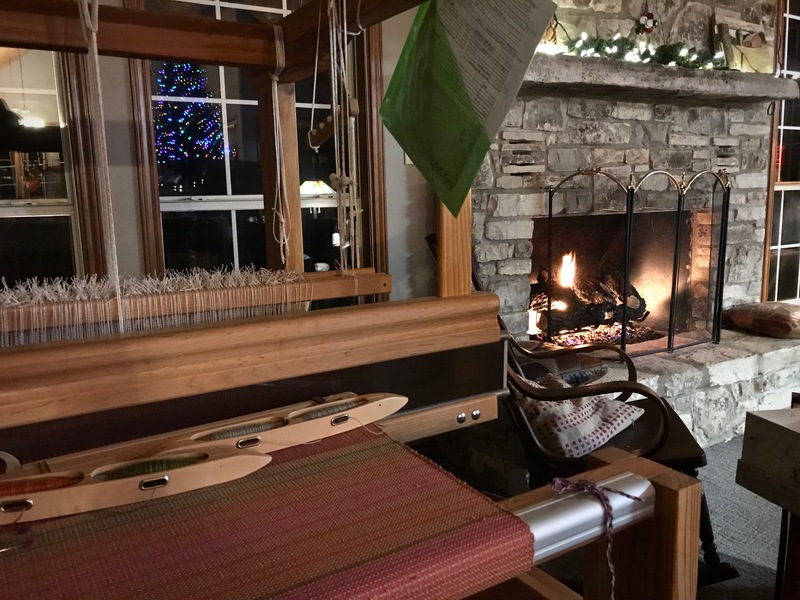 Merry Christmas, and I hope you have a wonderful new year, filled with many weaving hours! 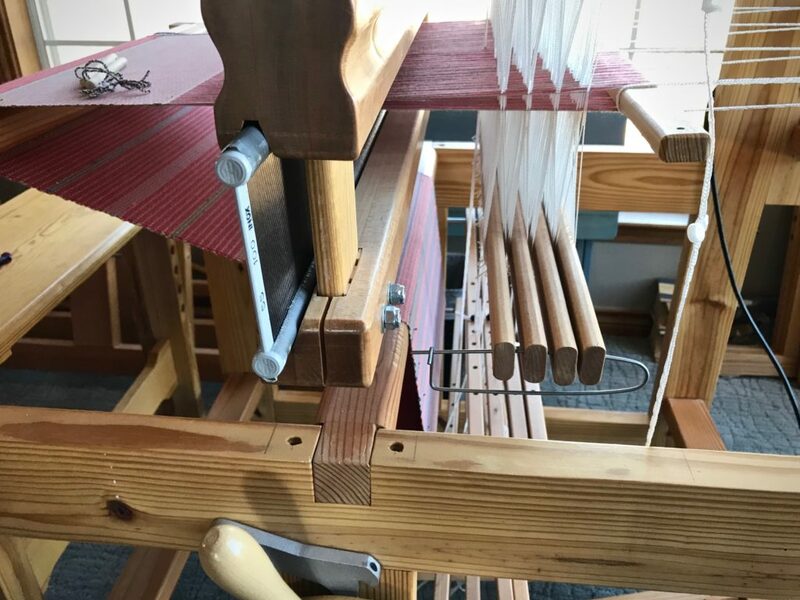 Marjorie, I smile at the thought of “many weaving hours!” What a sweet blessing! They’re lovely! Looking forward to seeing them finished. Hi Beth, I’m looking forward to seeing them on the table! I’ve started the finishing process, examining for errors. They are just about ready to go in the washing machine. Merry Christmas to you, Betsy! Thanks for responding! Merry Christmas to you and your family! Merry Christmas, Karen, and a Happy New Year! Joanna, Merry Christmas to you! Lovely! 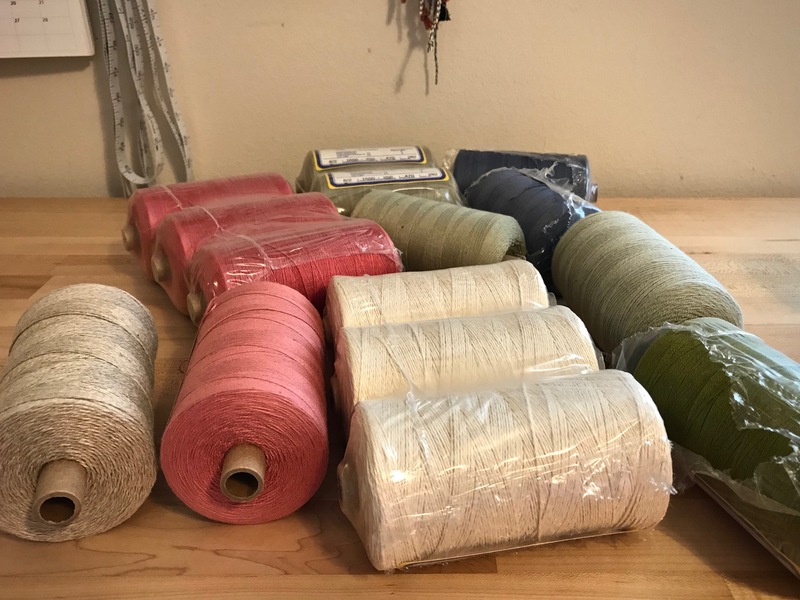 Doubled 8/2 cotton, May I ask what your sett is? Hi Robin, I’m glad you like them! I used a metric 55/10 reed. That comes out to about 13.5 dents per inch. Two doubled ends per dent, so it’s 11 doubled ends per cm, or 27 doubled ends per inch. Happy Christmas Karen, and all the best for the New Year. May the joy of weaving continue and thanks for sharing! Hi Gerda, Thank you for the kind words of blessing. Merry Christmas to you and your family, Karen! Merry Christmas Karen! Thank you for all your inspiration this year! Hope you have a great day!! Hi Liberty, It is truly a joy to have you meet with me here. Merry Christmas! Christ has come! Hi Linda, Merry Christmas! Immanuel. God with us. 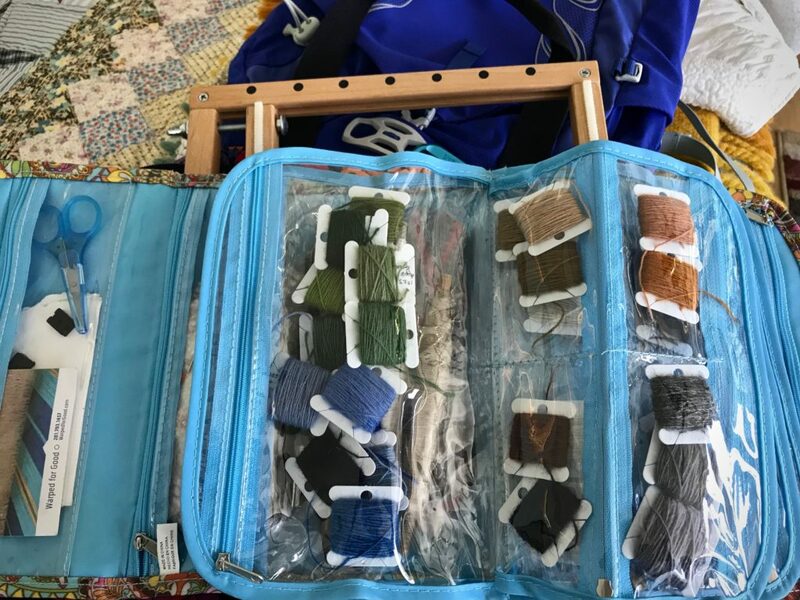 When I decided to use up some of the quills that have collected, I stumbled on one of my favorite techniques—color gradation. 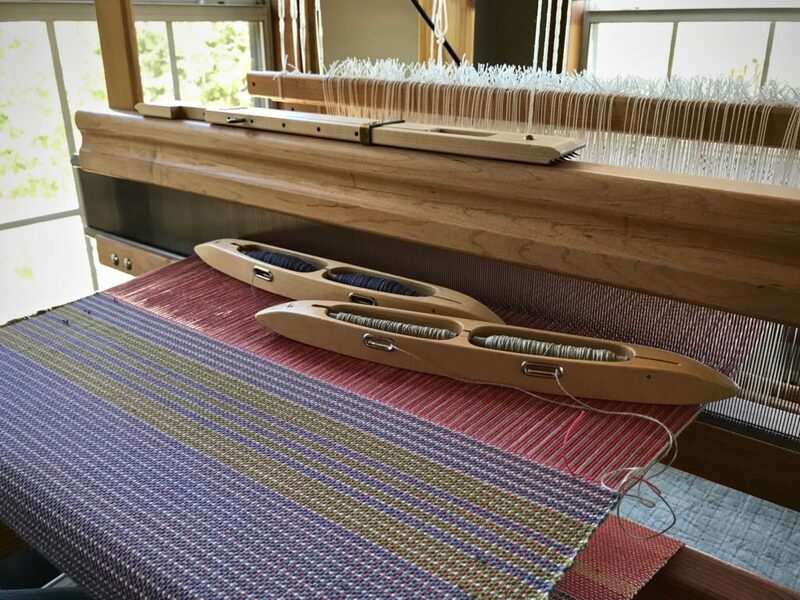 The weft colors change gradually instead of making distinct weft stripes. Remember the placemats on the little countermarch loom? 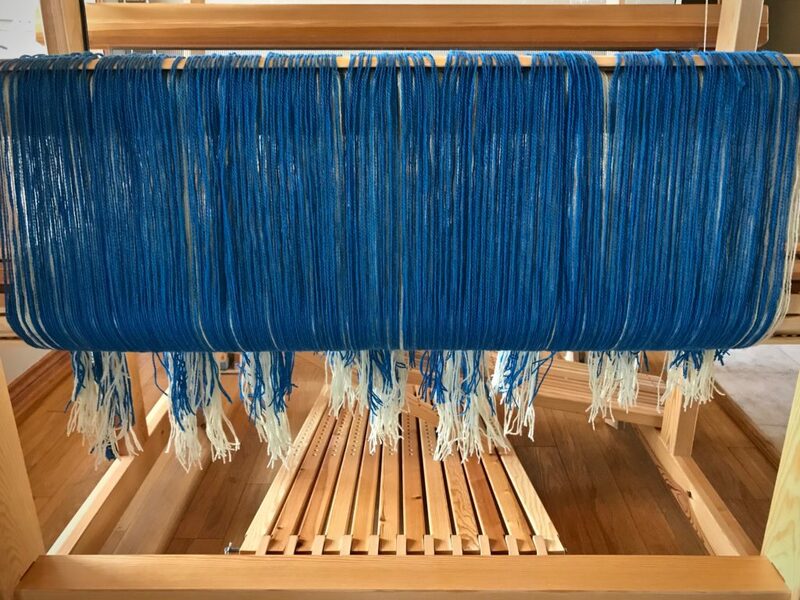 I am weaving the last few. Using up thread left on quills for some color gradation play. 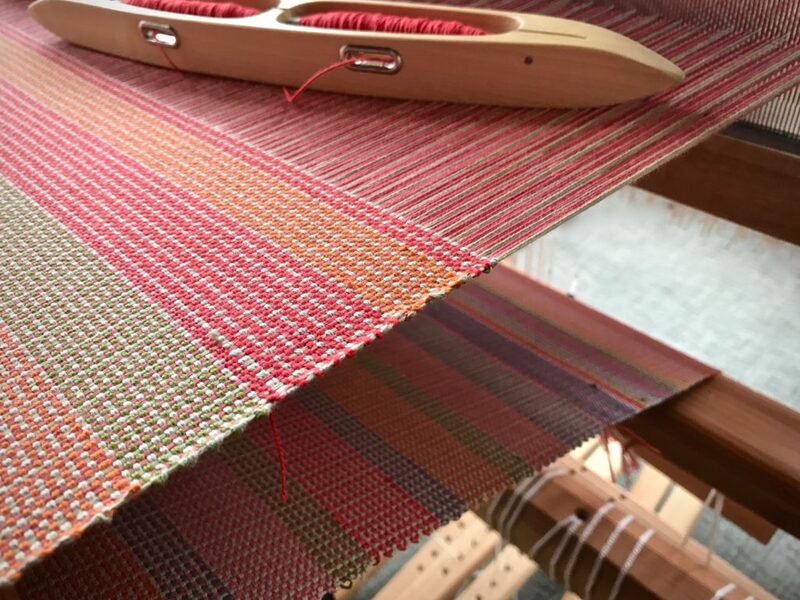 Color and weave effects on plain weave. 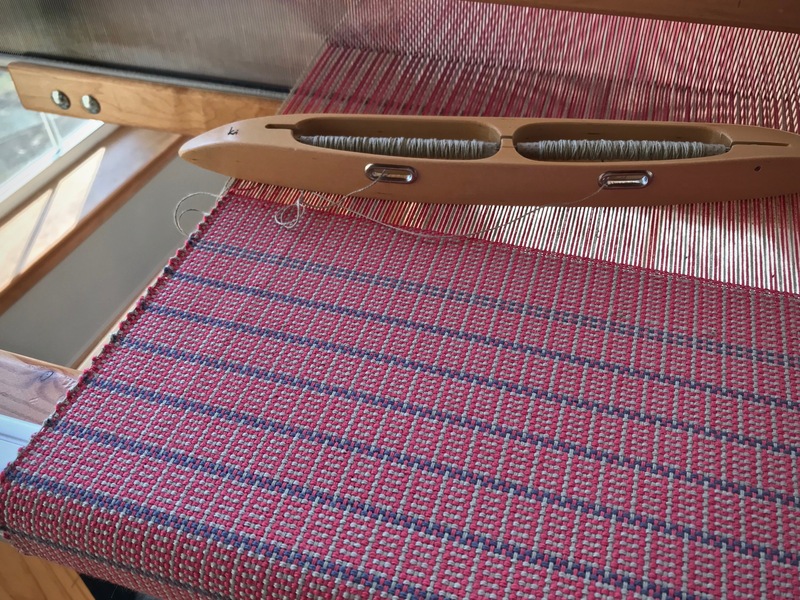 8/2 cotton weft is doubled. The quills on a double-bobbin shuttle don’t always empty at exactly the same time. The quill that has thread remaining on it goes in a box for later use. Those quills in the box are what I’m using here. 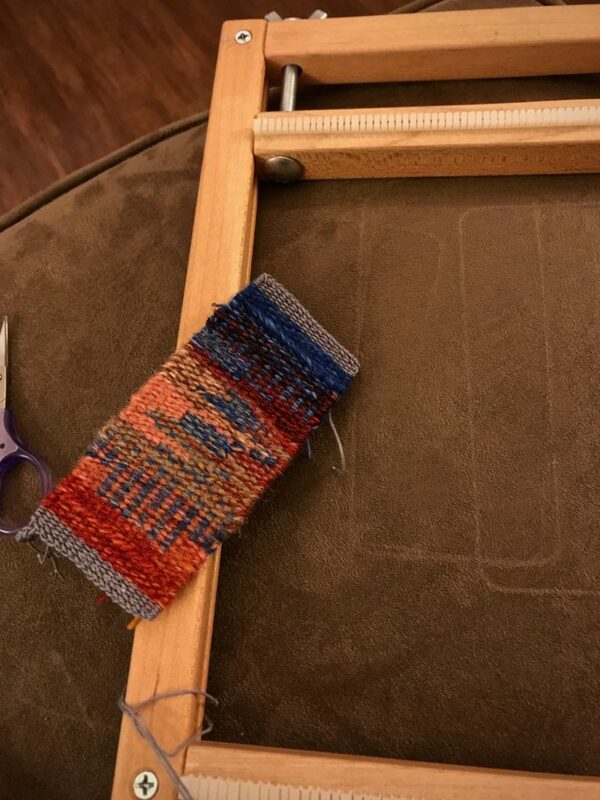 For this placemat I’m letting gradient color changes happen in varying increments, according to the amount of thread left on the quill. 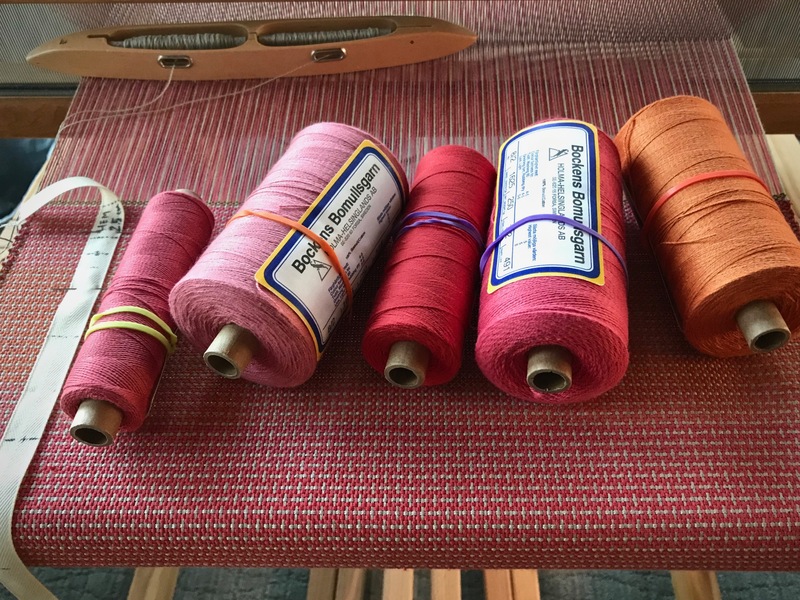 I have five shades of 8/2 cotton, ranging from coral pink to pumpkin. Color “sisters” play well together. 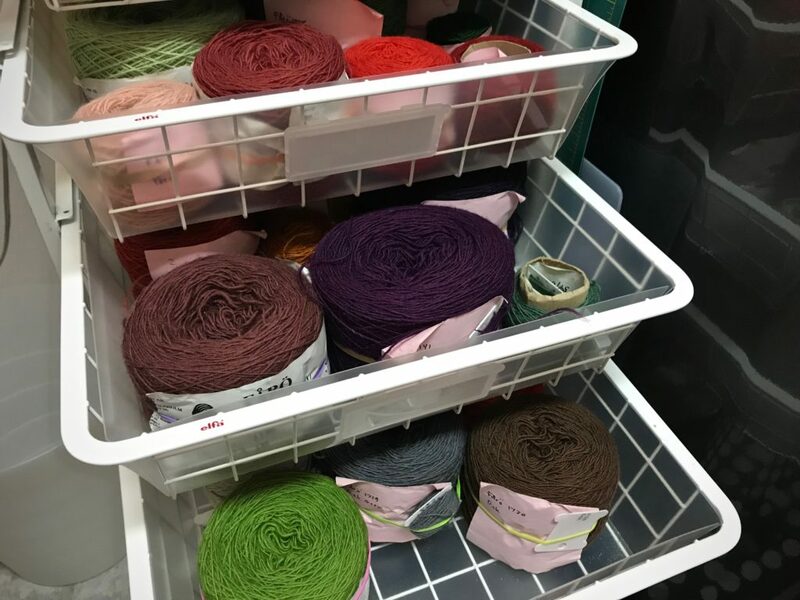 This is the perfect setup for some subtle color gradation: Five closely-related hues, a double-bobbin shuttle, and a supply of leftover quills. For best effect, I arrange the colors in order, from light to dark, or dark to light. Pumpkin color adds a pleasing subtle accent to the corals and reds in the cloth. May you make something beautiful with the little bits that you have. 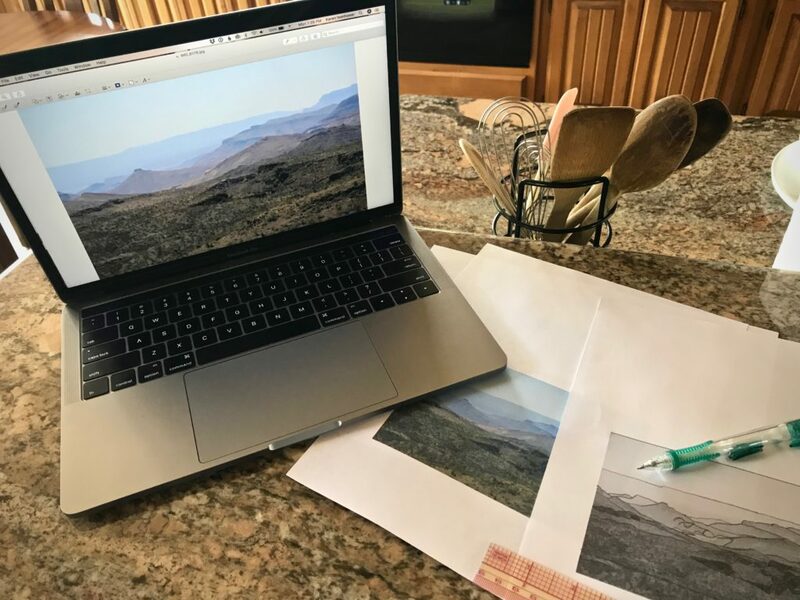 Hi Ruth, Thanks for sharing another way to transition the colors. That’s a great way to achieve a lovely gradient. It would be fun to do a sample piece with various ways to do color gradations. Or, that would be an interesting study group project. We turned on the Spurs game the other night and I took one look at the other team’s uniform and said “gradient!” Not something you often see in a basketball uniform, lol. Hi Betsy, That’s too funny! Who else is even going to notice such things? …unless we call it the popular name-“ombré,” meaning shaded in French. I realized on a recent project the subtle transition between two light colours, in different tones added depth. I decided to shake up the mix and make the transitions much narrower in the next project and didn’t have as near an interesting effect. It needed large areas each for contrast. Hi Vivian, I have noticed the same thing. The areas with a longer transition make more satisfying gradation. 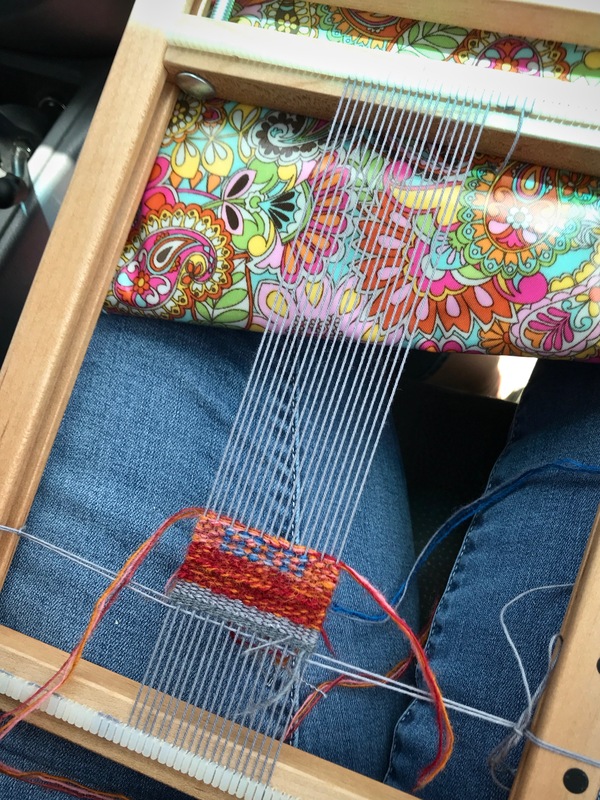 Though small, this pocket-sized tapestry took a few months to complete. 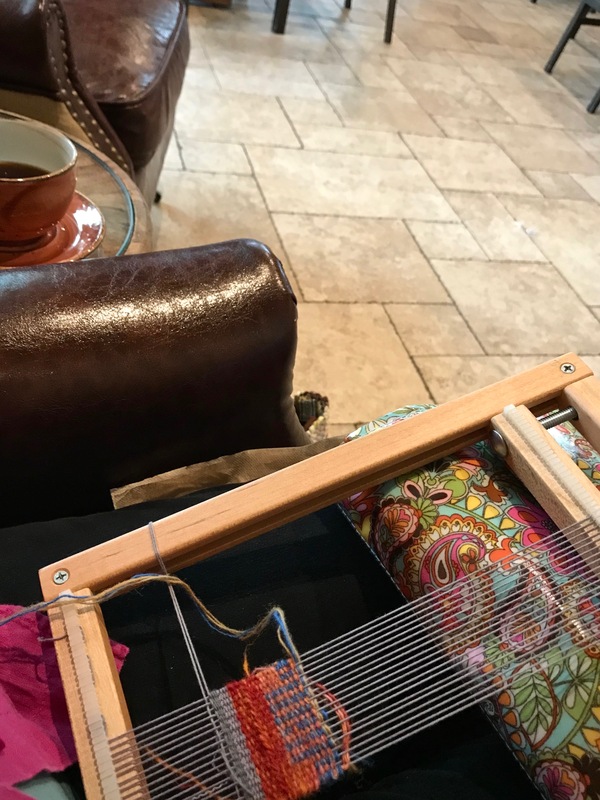 A car ride here, a coffee shop there, a move across town, and an imminent move across the state—this tiny tapestry has been in the background through it all. 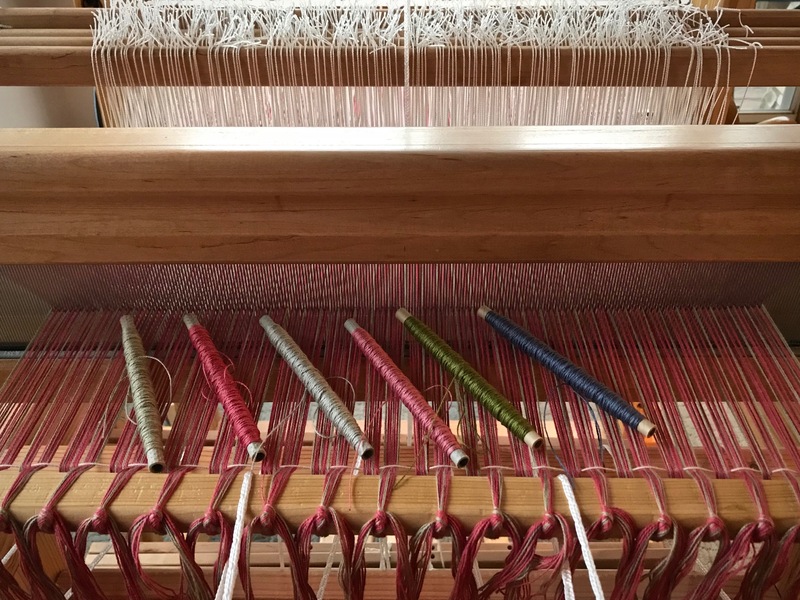 The weft tails are neatly trimmed, but the back is completely exposed. 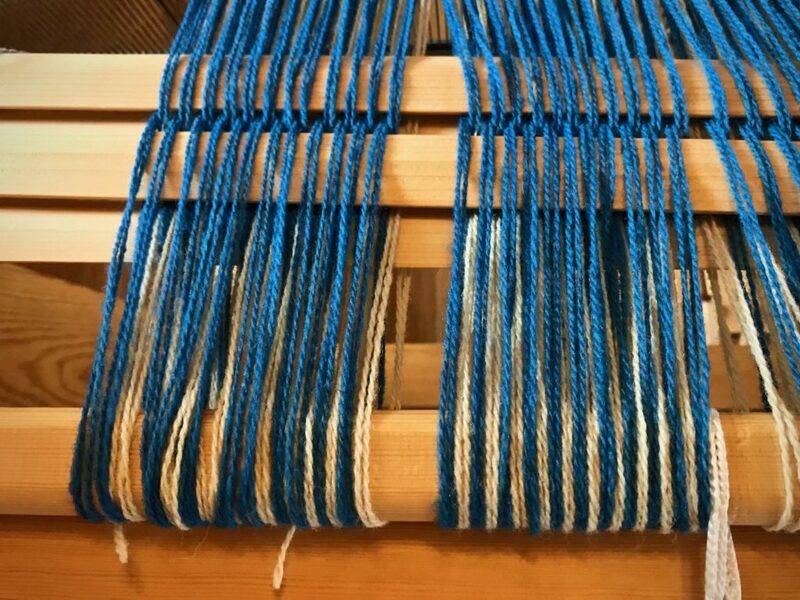 I’m not weaving the tails in this time, nor covering them with a fabric backing. 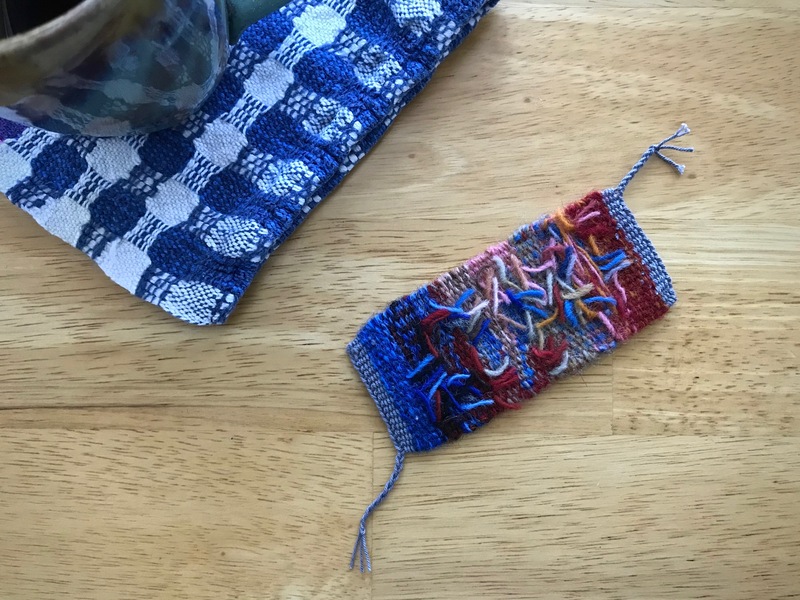 Just hold the tiny tapestry in your hand and feel it. 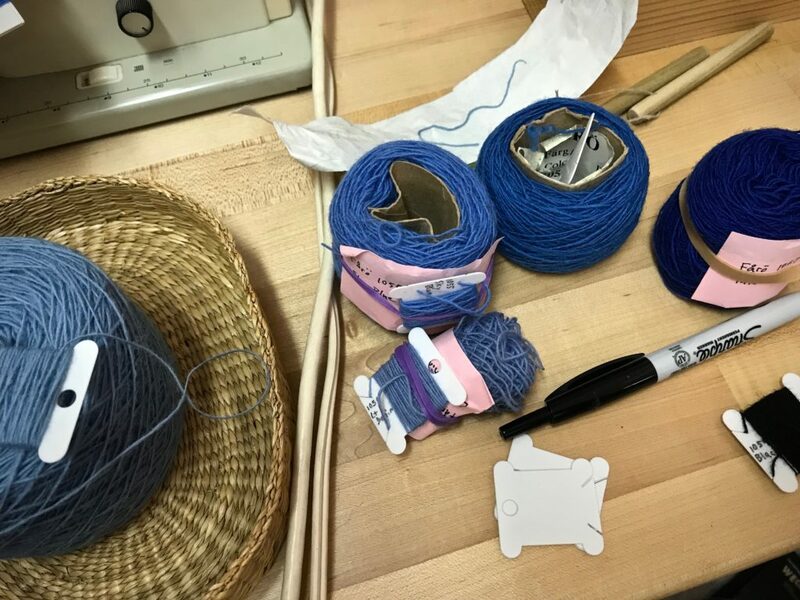 Remember that all the pleasant color distinctions and pick-and-pick samples on the front side have a back side, too. True, the back doesn’t make as much sense. 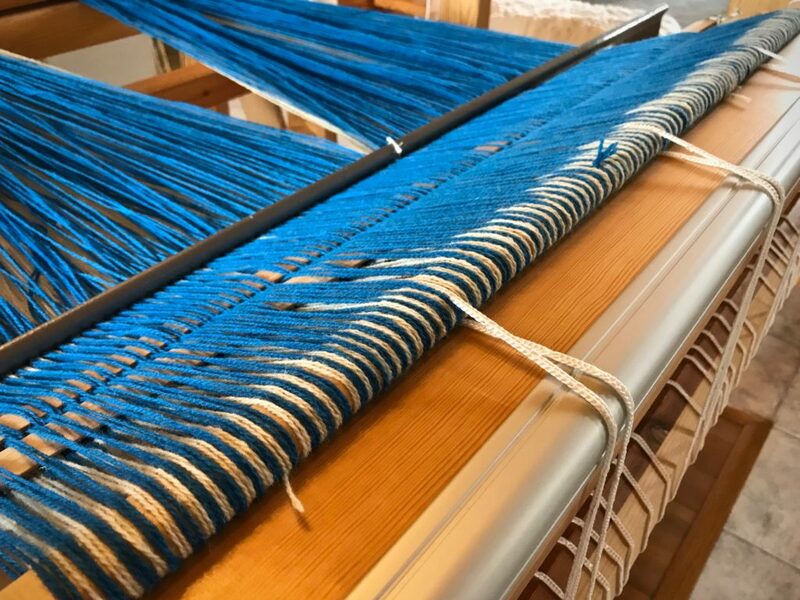 However, I want my friend who is receiving this to see and touch the heart of the weaving. 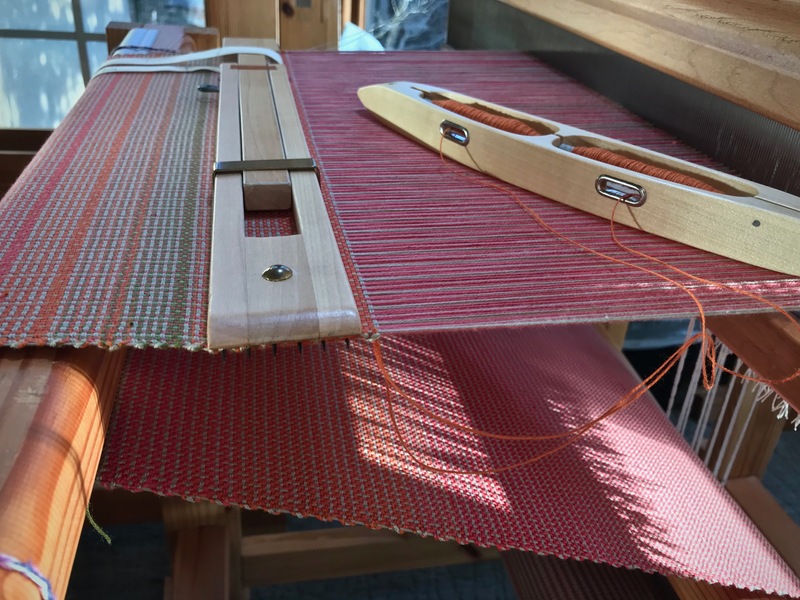 Using a needle to pull the warp ends back through the warp thread header. 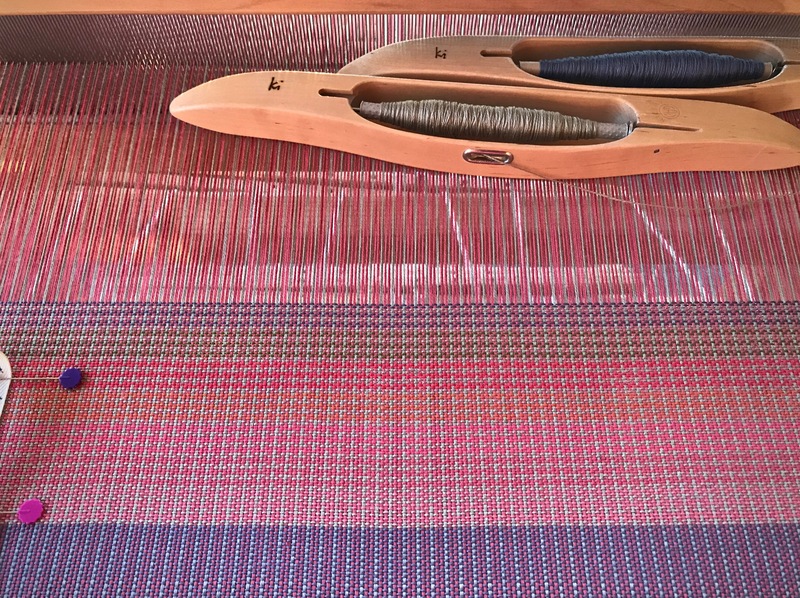 After pulling through, the warp ends are trimmed close to the surface. The weft tails are also trimmed to about 1/2″. 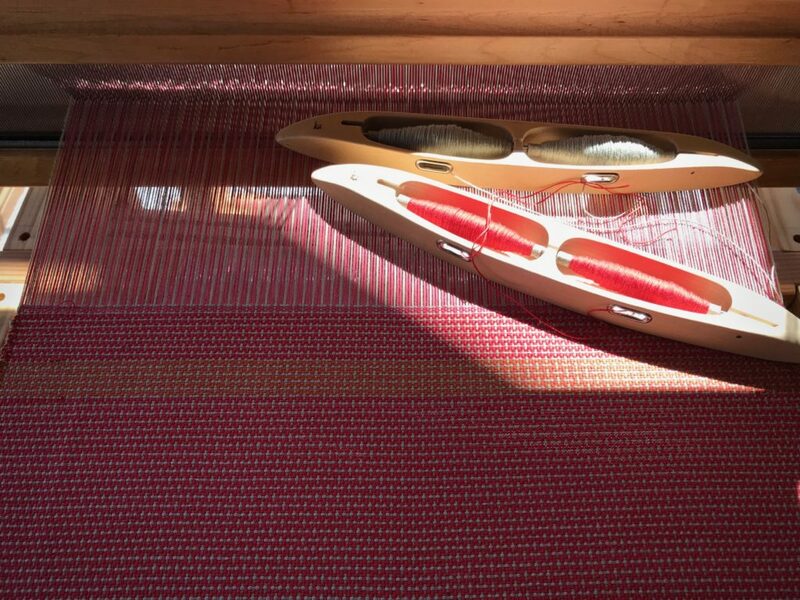 Steaming the tiny tapestry. 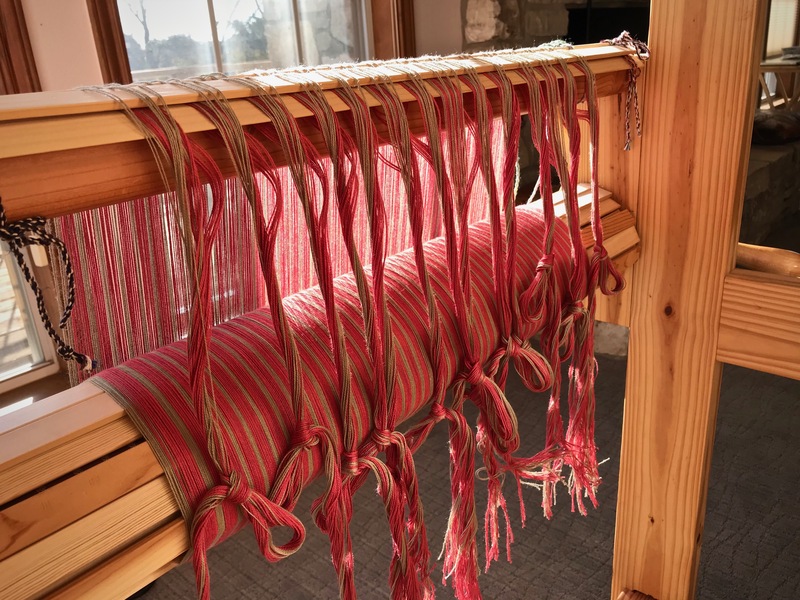 12/6 cotton warp pulls together nicely as the back of the tapestry is steamed. Exposed back of the tapestry reveals trimmed weft tails. This is a picture of grace. Look at the heart of the matter. We so often rely on the rules. Break a rule, and you’re condemned. But Jesus is interested in the heart. A pure heart doesn’t stand condemned. This is why the gift of his forgiveness is so wonderful. God knows the exposed messy side of our tapestry. Yet, his grace sees us as perfectly covered by Christ Jesus himself. May your hands keep making. That made me cry. (In a good, cathartic way.) Thank you for your beautiful words. Hi A.F., We all need a healing cry from time to time. 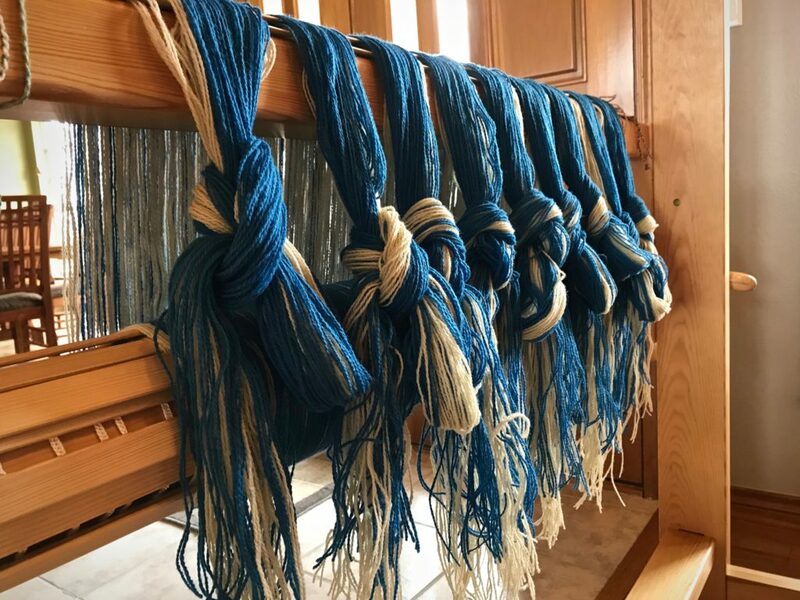 Hi Joanne, Every tapestry, every weaving has a story to tell. I’m honored that you take an interest in the stories I share. This adds layers of meaning and gratitude to the little tapestry! Grateful! Blessed! Hi Wende, I’m blessed by your friendship.